Merry Christmas! Or as we say here in Hawaii – Mele Kalikimaka! Here’s my most effective strategy for holiday marketing to give your wellness practice an end-of-year boost, jump-start your 2019 income, and offer your clients affordable one-stop shopping for every body on their list! Several years ago, I started offering my clients a new holiday shopping experience! It was an instant success and every year since, they look forward to it! Provide me with a holiday income boost. Offer Gift Coupons for short treatment sessions, sold in packages of 4 or 8 – the more they buy, the more they save per session. I offer 15-minute massages for $20 or less, depending on how many the buyer purchases. Adjust your offer to fit your modality – a brief, affordable intro to your work, sold in packages of cards that the buyer can give to multiple recipients. My clients buy them up like crazy for one-stop Christmas shopping! This short-session, lower-cost strategy works especially well for gift occasions such as Christmas, when we have the large expense of giving presents to many people at once. Of course, you should also offer Gift Coupons for your regular sessions as well. Save money, allowing them to buy more. Appropriate for any age, size or occasion. Easy to mail or email. Always have last-minute gifts on hand. Now here’s where the fun – and the income – really begins! You can leverage the Stocking Stuffer Special into even more income! Most of the Gift Coupons will be redeemed after the holidays. So the original coupon sales will boost your holiday income. And after the holidays, you can kick-start your 2019 income and avoid a post-holiday income slump! When the gift recipients call for their appointments, offer them an upgrade to a longer session for an additional fee. Because they didn’t pay for the gift, they see it as getting a bigger gift for a low fee – such a deal! Example: Your client buys her friend a $25 GC for an introductory mini-treatment. When the friend calls to schedule her appointment, you offer her an upgrade to a full session for only $50, letting her know that your regular full-session fee is $80. It’s a win-win-win – the giver saves time & money, the recipient gets a healthful gift, and you make more money! 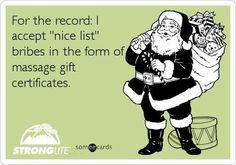 One of my massage clients, a corporate human resources director, bought 3 dozen 15-minute Stocking Stuffer Gift Coupons for her employees! Most of them chose to upgrade to 60 minutes for an additional fee of $50 – a great deal for them and more income for me! 36 gift coupons @ $20 each = $720 + 30 upgrades @ $50 = $1500. Total = $2220 from just one Stocking Stuffer sale! As an added bonus, 13 of these coupon recipients became regular clients who now buy gift coupons for their friends, who then become regulars, etc. etc. Yes – referral-based marketing at its finest! Bodywork is ideal for this strategy. Other modalities might be more challenging to adapt to selling packages of mini-sessions. Wouldn’t this be a great gift for an overwhelmed parent?! When she calls for her appointment, offer an upgrade to a longer intro session that delves a little deeper into her situation. Another example: A nutritionist’s Stocking Stuffer offer could be a brief session to learn the person’s health/nutrition goals and give basic food or nutrition info; the upgrade offer could be a simple cooking demo or a grocery-shopping trip to learn about healthy foods. What a great help this would be to someone transitioning to a healthier diet! The point is to get creative with your holiday marketing and make it affordable for your clients to share your skills with their loved ones, while boosting your business with new clients and more income! Once I figured out the Stocking Stuffer strategy, I needed a way to promote it. Don’t miss my special system in next week’s post! Meanwhile, get started with your very own Stocking Stuffer Special! Decide on your Gift Coupon offer, and design and print your Gift Coupons. Then you’ll be all set for next week’s article – to help you bring in more money, attract new clients and create more time to enjoy your holidays! This entry was posted in Gift Certificates, Holidays, Holistic Health Practitioners, Marketing, Marketing for Christmas, Seasonal Marketing and tagged christmas marketing, gift certificates, holiday marketing by The Prosperous Practice.Bookmark the permalink.